GenTemp remote GSM temperature alarms are available from Orbit Communications to monitor temperatures in computer server rooms. GenTemp remote GSM temperature alarms continuously monitor computer server rooms and send an instant SMS alert to up to 5 mobile phones as soon as temperature variation is detected. When the temperature rises above the user-programmable temperature alarm point, the alarm is sent via the GSM or Next-G mobile phone network to help protect valuable computing resources. 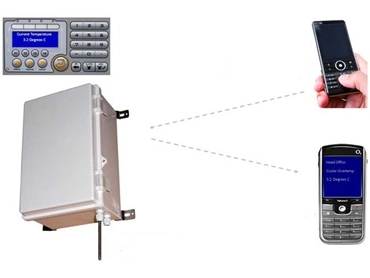 The remote temperature alarm system operates on GSM as well as Next-G/3G mobile phone networks and comes with a high gain antenna to ensure reliable contact with the mobile phone network in weaker signal areas. The user-programmable temperature alarm trip-point can be set anywhere from -50ºC to +150ºC. Typically the temperature alarm trip-point would be set around 28ºC to 33ºC. Current status of the system can also be requested by sending a text command message remotely to the GenTemp alarm system at any time from any mobile phone. GenTemp GSM temperature alarms will respond by sending the current temperature back to the mobile phone that requested the information. Software supplied with the GenTemp GSM temperature alarm system enables a user-defined password to be set to prevent unauthorised use of the system. Additionally, users can remotely switch a digital output ON or OFF within the GenTemp unit that enables switching on a fan or any other cooling device as a temporary solution for temperature control until the maintenance person can fix the cooling issue. A battery backup system is supplied optionally so that GenTemp can run from the backup power source in the event of a power failure. The system will also send a Mains Failure alarm message directly to up to 5 mobile phones. The battery voltage is also monitored and in the event of low battery voltage, a low battery alarm is sent remotely via the GSM or Next-G mobile phone network. Optional display, keypad and local alarm indication can also be fitted into the GenTemp remote temperature alarms. In addition to the remote alarm indication by GSM or Next-G mobile phone network, these optional fittings provide instant visual indication of current temperature as well as a local audible and visual alarm in case of over-temperature condition. GenTemp has been engineered to provide a reliable solution for remote monitoring of room temperature and ongoing dependable performance. The remote temperature monitoring system is designed, manufactured and 100% fully supported in Australia by Orbit Communications .